n recognition of National Hunger Action Month, the A.E. Stringer Visiting Writers Series at Marshall University will kick off the 2018 fall semester with its annual Writers Harvest, a literary event to support the Facing Hunger Foodbank. 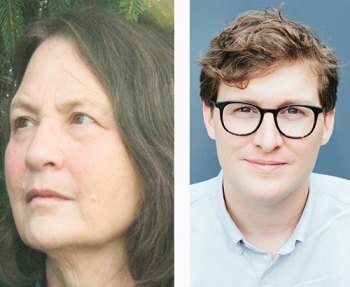 The event is planned for 7:30 p.m. Thursday, Sept. 20, in the Shawkey Room of the Memorial Student Center, where authors Eric Smith and Mary Imo-Stike will read from their works and host a Q & A and book-signing. Smith’s poems have appeared in Five Points, Indiana Review, the New Criterion, and the Best New Poets anthology. He co-founded the text message poetry journal cellpoems, and is the recipient of a North Carolina Arts Council artist fellowship. His debut poetry collection, Black Hole Factory, is the winner of the Tampa Review Prize for Poetry. He is an assistant professor of English at Marshall University. Mary Imo-Stike worked “non-traditional” jobs as a rail worker, construction plumber, boiler operator and gas line inspector. After retiring from work life, she obtained an Master of Fine Arts degree in poetry from West Virginia Wesleyan College in 2015, and was the poetry co-editor of HeartWood. Her work has been published in Antietam Review, Phoebe, The Pikeville Review, Appalachian Heritage, Connotations Press, riverSedge, Cactus Heart and Young Ravens Review. Her chapbook “In and Out of the Horse Latitudes” was published in 2018 by Finishing Line Press. She is also the co-creator of More Than Words*, a monthly community literary event in Hurricane. A suggested donation of two or three nonperishable food items would be appreciated for admission. Drop-off bins will be available at the reading. The Facing Hunger Food Bank serves 116,000 food-insecure people throughout the 17-county service area and 3,800 children weekly with backpacks of food supplies through the school year. The A.E. Stringer Visiting Writers Series is sponsored by Marshall’s Department of English and College of Liberal Arts.